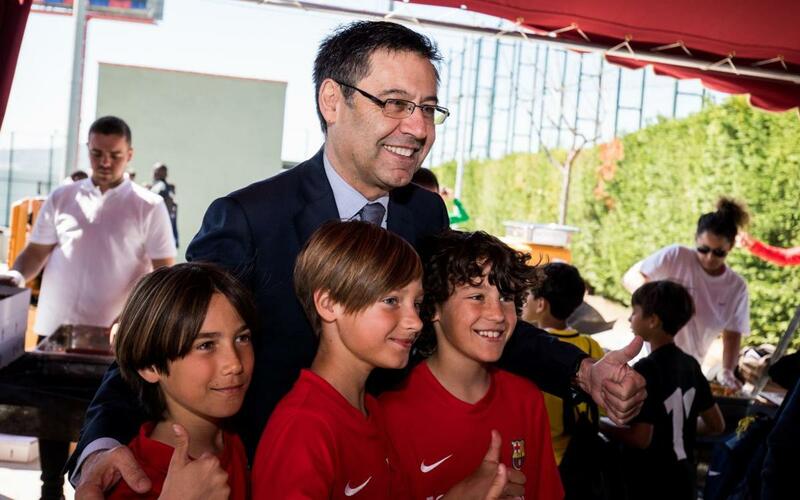 FC Barcelona president Josep Maria Bartomeu was at the Ciutat Esportiva Joan Gamper this Weddnesday to enjoy some time at the FCBEscola International Tournament, and experience first-hand how much the competition has grown for what is now the seventh edition. He was accompanied by the director of the FCBEscola programme, Carles Martín. He walked around the different pitches where the quarter and semi finals are currently being played at an event that has brought together more than 1,900 boys and girls aged 6 to 14 years old from 45 FCBEscolas and FCBCamps in now fewer than 22 different countries. Bartomeu spent some time chatting to the participant teams and some of their relatives. This year’s tournament ends on Thursday 29 March with the four finals (U8, U10, U12 and U14) in the Miniestadi. The trophies will be presented by none other than first team star Sergi Roberto.